Here are some photos of Montessori training session for the two pre school teachers, Brenda and Yasmina, in the schools built by FoM . 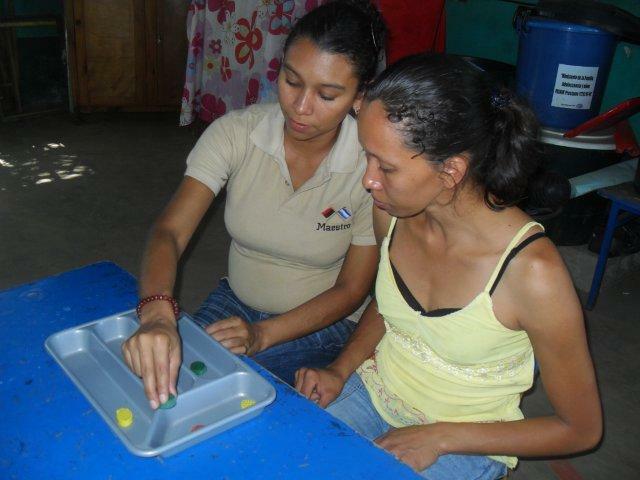 The training was conducted at the El Arbolito pre school and has been a great success. BLINC are eagerly anticipating International Women’s Day for 2013 and will be making a contribution to this event. 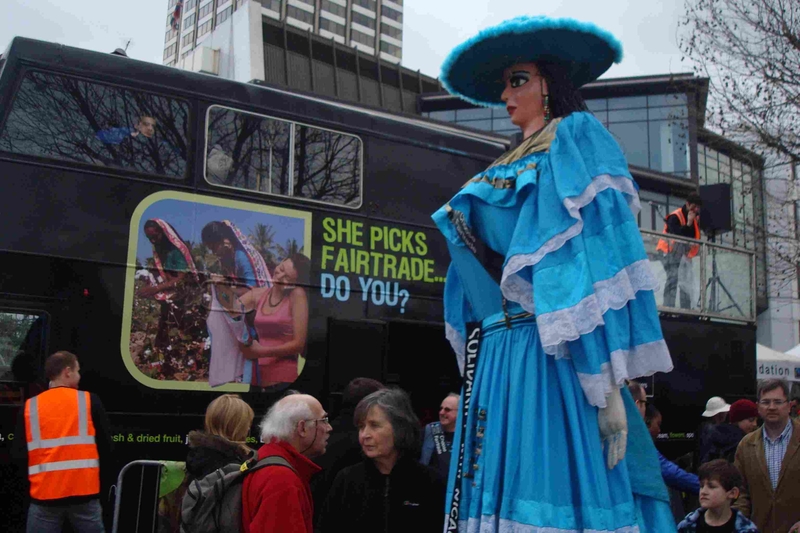 We are bringing fair trade honey producer, Agueda Ordenana, to Bristol for Fairtrade Fortnight to work in local schools with over 2,000 children. She will be the keynote speaker an evening to celebrate this IWD, talking about her life as a women’s development worker with her Tierra Nueva co-operative. Songs by Shanta plus a fairtrade chocolate tasting thanks to Divine. Friday 8 March 6pm to 9pm at Mshed. Women and men welcome. The UK’s top Diplomat, Simon Fraser was in Bristol last week. BLINC was able to send a representative to the international round table meeting at City Hall and we were able to put across three key points to the head of the diplomatic service. We encouraged the FCO to consider re-opening the British Embassy in Managua after 8 years as they have done with their one in San Salvador. We welcomed the recent appointment of Chris Campbell as British Ambassador to Nicaragua but he is based in Costa Rica. We asked for more structured and regular meetings between Ambassador Campbell and all the in-country representatives of the dozen or so twinning associations as well as project visits. Finally to asked for the process of applying for funding via the Embassy to be made more transparent. Simon Fraser noted our requests and confirmed they would be followed up! Lets see. One of BLINC’s volunteers Keith Ripley is currently out in Nicaragua teaching English in the Tonela secondary school, T.E.KINT. Check out his blog http://krinca.blogspot.co.uk/ for information on his trip! Friday Night 25 years celebration. BLINC members and friends gathered at the Thunderbolt pub in Totterdown on Saturday the 8th of September to celebrate 25 years of Friday Night Football with Red Star Bedminster. The night included a variety of delicious Nicaraguan-inspired food, inspiring new art work and excellent live music such as ‘Here come the Night Jars’ and ‘Ska DJ Pete’. The evening raised a wonderful £200 and was enjoyed by all. Bristol Link with Nicaragua volunteers Tom, Lydia, Danni, Katie and Lyle working at the two festivals ‘Proms in the Park’ and ‘Radio 2 Festival’ managed to earn £400, an amazing achievment. This will help to provide for BLINC’s activities towards helping Puerto Morazan and Nicarguan projects. 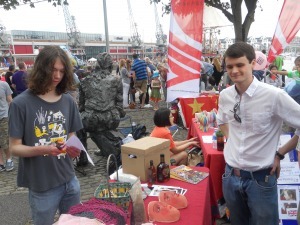 On the 5th of August BLINC hosted a stall within the Amnesty International Garden Party. Despite the weather the day went well with a number of people visiting the BLINC stand. There was a variety of activities for children to encourage a wider understanding of Nicaragua, as well as a more advanced quiz for adults. 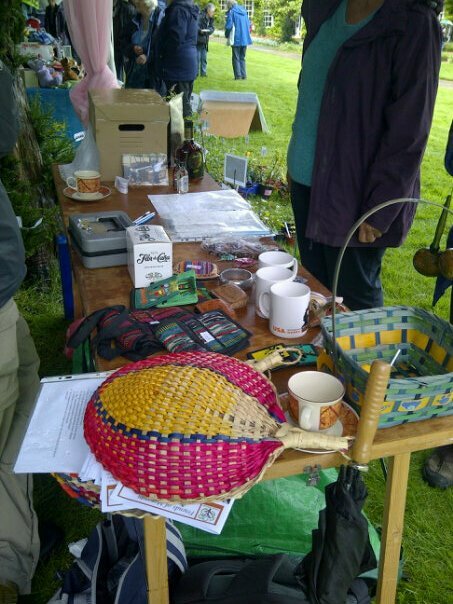 The stall also contained some authentic Nicaraguan goods and a lot of the jewellery was sold. Throughout the day the rum raffle was added to and drawn when the event ended- congratulations to Gerard Owen on buying the winning ticket. BLINC have identified their producer for the Fair trade Fortnight who will be visiting a number of different schools to create awareness for Fair trade and teach young children about working in Nicaragua. Águeda Ordeñana Avedaño is a honey producer from Bocao in Nicaragua. This new production line will open a gateway for local bee producers to get involved in the event. 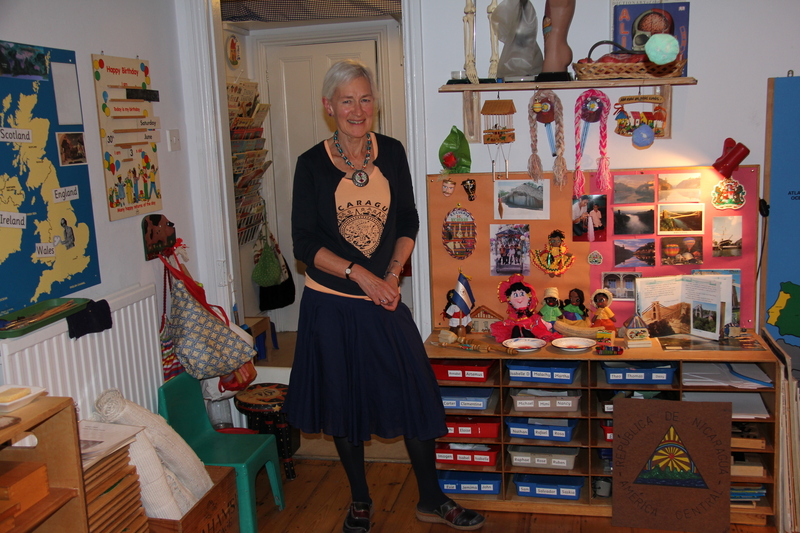 The BLINC team is looking forward to see her contribution to Fair trade Fortnight of 2013. On the 21st of July, Bristol celebrated their annual Harbour Festival. BLINC had their own information stand, promoting support and awareness for Nicaragua. The stall had a variety of fun games for young children, encouraging them to learn important things about the Nicaraguan quality of life. There was also a fund-raising raffle for a bottle of Nicaraguan rum which raised over £40. This total will hopefully increase during the Amnesty International event on the 5th of August, in which BLINC will be taking part. Regional Premiere of La Yuma, the first Nicaraguan feature film for 20 years was shown on Thursday 19th July at 6pm at the Watershed. After a short introduction from the Nicaraguan Embassy the film began and was a great success. This interesting and moving story line was enjoyed by the viewers and will hopefully encourage the production of more Nicaraguan films. Half of the profits from the evening will go toward BLINC projects. After the screening there was an informal meal to celebrate the anniversary of the Nicaraguan revolution and hear about the successes of the last few years of Sandinista rule with Guisell Morales, Nicaraguan attachee. During their training of Montessori teaching methods, two Nicaraguan teachers Ana Julia and Roxana enjoyed a social gathering with BLINC representatives and runner of the Clifton Montessori Preschool Roz. The meal contained a variety of English and Nicaraguan food, both of which were thoroughly enjoyed! 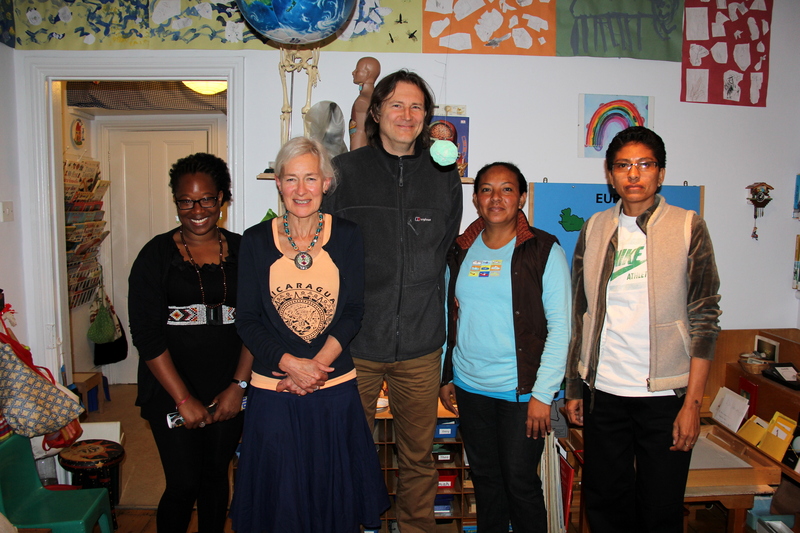 Ana Julia and Roxana were also able to visit the Montessori Preschool before Roz steps down as teacher after 23 years. Goodbye to Roz, thank you for all your help! Copa Sandino – football for Nicaragua. To0k place on Sunday 20th May at Ashton Park school. Over £1700 was raised for water projects in Puerto Morazan. The “Salmons” from Bedminster beat La Ruca in the Copa Sandino final while Real Madras beat Red Star Wednesday in the final of the Plato Collett. Easton Cowgirls won the womens Copa Lucrecia Lindo tournament. Thanks to everyone who helped, played, refereed and DJ -ed. Elspeth Reid from Bedminster ran the 10k and raised £600 for Friends of Morazan’s work with under fives in Puerto Morazan. the night before the race she made loads of cup cakes for sale at the Copa Sandino which raised a further £60. Muchas gracias Elspeth. BLINC executive member Claire Carpenter ran the London marathon a couple of weeks back and raised three thousand pounds for BLINC and the Nicaragua Solidarity Campaign. Well done Claire – fantastic achievement. She is only the fifth person in history to run the London marathon for BLINC. Key speaker was Sandra Rojas, womens community activist and fairtrade sesame seed producer from Achuapa in Northern Nicaragua. Other speakers plus DJs, singer and food. 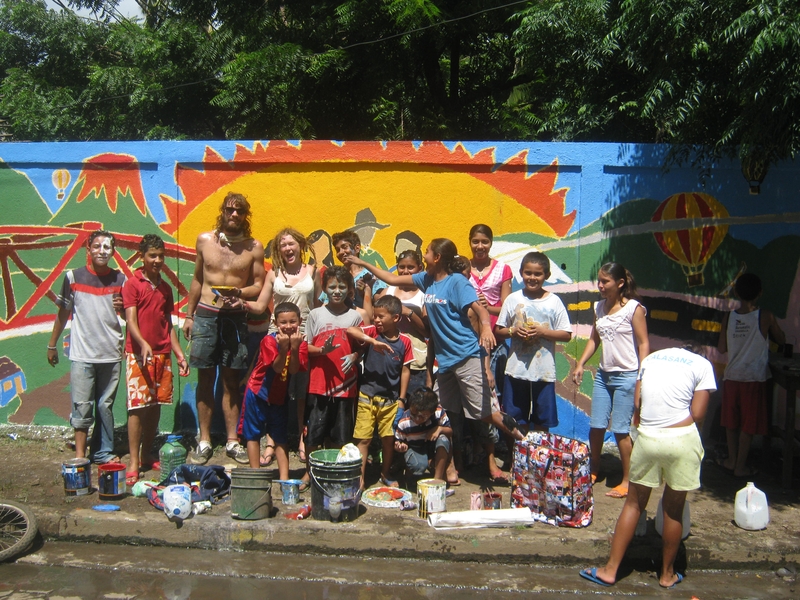 In june BLINC volunteer Isobel Tarr from Nailsea near Bristol has overcome having her passport stolen in Guatemala and being stranded there for a month, to reach Puerto Morazan and set up a mural project. 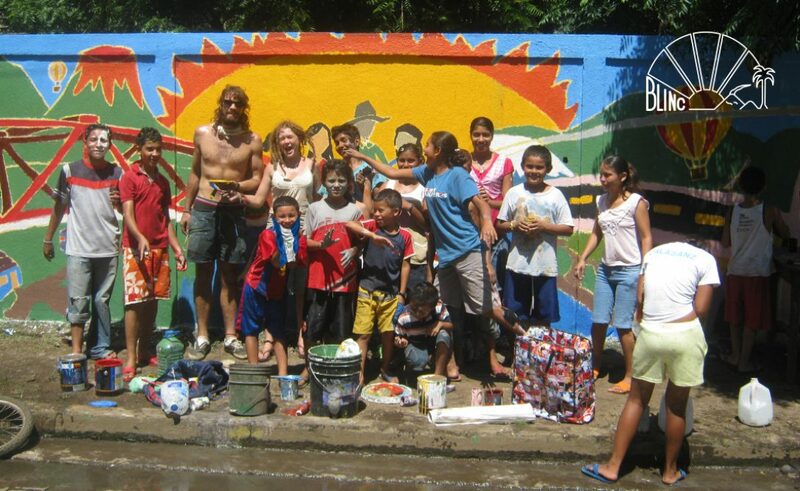 Isobel with a small grant from the Lord Rootes Fund, has been able to arrange two mural projects with local young people and children in Tonala, Pto Morazan. 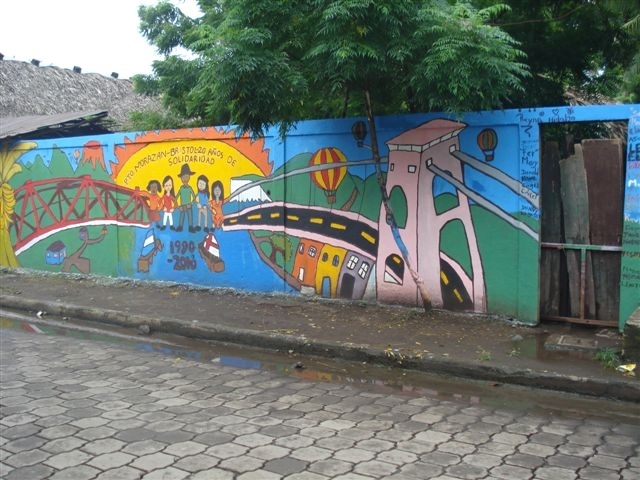 A special visit to the regional capital was arranged for participants to view the revolutionary murals of Leon and meet some of the muralists to learn a few tips. The Copa Sandino in May raised over £1600 for BLINC projects. Two hundred people came to the event and the weather was kind. This year the womens tournament the Copa Lucrecia Lindo took place on the same day and resulted in headaches for the organisers, a broken wrist for Lisa B and some great football. Somerset FA kindly sponsored two referees this year and a womens team which was great. And Young Bristol did a brilliant job lending us the goal posts. Big up to all of them. The Copa Sandino was won by the Salmons and the Copa Lucrecia Lindo by Windmill Hill Dynamos. All results below! BLINC volunteers took a year out from organising a contribution to International Womens Day this year but did run a stall at the main event at the Council House. 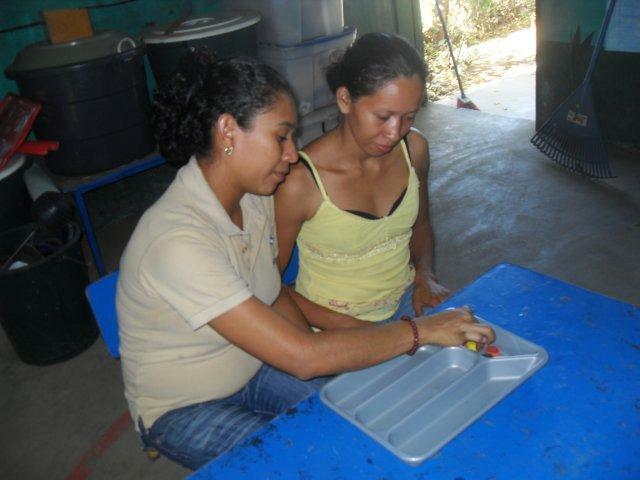 Nicaraguan jewllery and artesania proved popular and BLINC made £60 towards our work in Puerto Morazan. At a recent projects group meeting it was decided BLINC would fund projects this year to build several basic kitchens for pre-schools plus put new rooves on school buildings. Parents and community volunteers will provide the labour and skills. BLINC supporters will also fund a capacity building project for primary teachers around delivering art in the classroom including providing a range of materials for two rural pre-schools. BLINC’s registered charity “Friends of Morazan” which works primarily with under fives, has agreed through the generosity of one supporter to pay the salary of a fifth pre-school teacher in one of the small rural communities in the municipality of Puerto Morazan. An evaluation visit to the area yesterday by BLINC development worker Gioconda Perez provided a range of photos of pre-school activity based on the Montessori method which has been introduced into the municipality over several years by the Clifton Childrens House. BLINC has also recently helped fund a two day workshop for pre-school teachers on using drama and performance. The teachers below visited the regional capital, Leon, for the training sessions where they also undertook a computer course supported by the Clifton Children’s House.